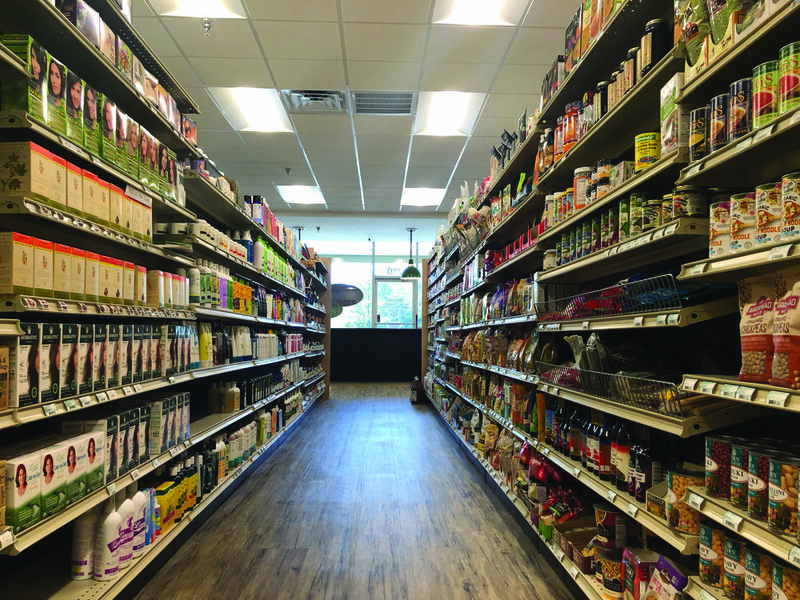 Fairhope Health Foods employees smile when they hear customers say, “We love your new expansion!” When you walk through the new double-door entrance, the updated space does feel bigger, but in reality, it’s not. “It shows you how much good lighting, fresh color and views to the outdoors can transform your experience of a space,” says architect and owner of WATERSHED, Rebecca Bryant, who guided the design of the store’s recent renovations. Fairhope Health Foods, the first health food store in Lower Alabama, opened in 1975. Along with Virginia’s Health Foods (their sister store in Mobile), they are known for excellent customer service and expansive product inventory. In addition to supplements and health foods (including fresh, organic produce), the stores stock a variety of products that include natural cosmetics, natural pet food and products, eco-friendly cleaning supplies and fair trade gifts. Bryant has been working on plans for their remodel with owner Lynnora Ash since 2017 and construction started around Thanksgiving of last year. “It’s like we do with our bodies—you say you want a healthier, newer you. That’s what we wanted for our store,” says Ash. This health-centered mission inspired Bryant to focus on two strategies—active design (which promotes physical, mental and social well-being) and biophilia design (which connects people to nature). WATERSHED used the Fitwel guidelines, created by the Center for Active Design, to inspire the design. Custom bike racks are being installed to accommodate customers and employees who wish to take advantage of the sidewalks and bike lanes that are accessible from the store. Inside they used certified low-emitting materials for the floor, ceiling, paints and adhesives, and care was taken to protect the store from indoor air contaminants during construction. The implementation of a green cleaning program for after construction is also required by the certification. To foster the health of their staff, the break room was made more private and includes an area for breastfeeding employees that need to pump, plus space for everyone to store their own fresh foods. Better ergonomics is a priority that influenced the addition of sit-to-stand desks. Accessibility upgrades for disabled customers and employees (including restrooms) is a part of Fitwel’s standards and something Ash emphasized early in the process. Since moving to their current location in 2001, they have expanded several times. “That’s why there were poles in the middle of some of the aisles—the current space used to be three separate stores. Lynnora started in one of the spaces and expanded her store into two more,” explains Bryant. By shifting the aisles so the poles are no longer blocking the path, they appear wider and are now more accessible for wheelchairs. Biophilia, a term coined by Alabama native E. O. Wilson, describes our innate affinity with nature. When applied to design, biophilia tries to connect people to nature using spatial relationships, materials, lighting, ventilation, views and actual nature (often in the form of plants). The base of the checkout counter will mimic the window screen with the same maple and the top is granite. To reduce waste they used existing shelving but updated their look by painting the backboards black and enlisting a local cabinet maker to build endcaps with another natural material—maple. In addition to switching to highly efficient LED light fixtures that are closer to the color temperature of sunlight, highly-reflective paint colors were used on the walls. Compared to the previous earth tones, the color palette is simpler but the walls are more dynamic, since they react to natural light as it changes throughout the day. A green screen of vines outside the store will soften the views of the parking lot and create better outdoor seating for the Sunflower Café next door. This element will also establish a visual identity for the store so they are more easily identifiable in the long retail strip. Additional standard practice environmental improvements include enhanced energy efficiency via new insulation that is formaldehyde-free and high in recycled content, plus the installation of Water Sense certified plumbing fixtures. Ash was immediately rewarded for the energy and water conserving updates with a savings of approximately $1,000 on her monthly utility bill. Ash and her staff have prioritized the health of their customers for more than four decades. This renovation not only supports that commitment, it demonstrates an elevation in their wellness standards that will likely have an impact beyond the store’s walls. Fairhope Health Foods has raised the bar for smart design, and we look forward to seeing how their actions and intentions inspire others community-wide. Location: 280 Eastern Shore Shopping Center, Fairhope, AL. For more information, call 251-928-0644 or visit Va-FairhopeHealthFoods.com. Peak Alkalinity, in Fairhope, offers a simple solution for the prevention and management of diabetes—alkaline water. Because the body thrives on an alkaline pH as opposed to a lower acidic pH, drinking alkaline water can boost the body’s natural detoxification process, improve immunity, facilitate weight management and slow aging. Alkaline water can also help the body manage insulin production (and therefore manage diabetes) by neutralizing acidic conditions. A healthy pancreas helps maintain alkalinity in the body but poor dietary habits that cause fluctuating blood sugar levels can exhaust the pancreas and lead to diabetes. The smaller clusters of water molecules in alkaline water are easily absorbed by cells to help hydrate and flush acidic toxins, plus it contains ionized calcium that the pancreas can efficiently use to do its job. “As you replace the ordinary water you drink with alkaline water, you will start to see the many benefits available to you,” says Missy Guitterrez, owner of Peak Alkalinity. “Over time, the alkaline water will help to balance your system out.” For even faster results, Guitterrez also recommends a more alkaline diet, which includes more fruits and vegetables and less meat and dairy. For more information, visit peakalkalinity.com.